You can't get closer to the ocean than this unless you're on a boat. The property is beautiful and well kept. 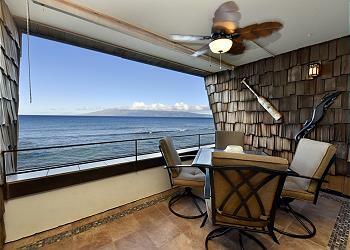 Watch the whales December through April from your lanai and sunsets every night all year long. Enjoy a moment of Hawaiian culture with the Conch blowing at sunset. Explore Maui by swimming, snorkeling and relaxing in the island sun and breezes. This unit has all the comforts of home. This fully furnished and supplied 2 bedroom, 2 bathroom, 2 story has an amazing 3rd story view. BBQ's, On-site laundry, oceanside pool and serene landscaping are yours to enjoy. Note: There is NO ELEVATOR. Stairs only.